The latest gen Intel HD graphics is baked into the new BIOSTAR J3160MD featuring peformance improvements over lastest genenartion Intel IGPs. This gives the board excellent performance and support to play 4K UltraHD content and deliver a stunning multimedia experience from a small package. 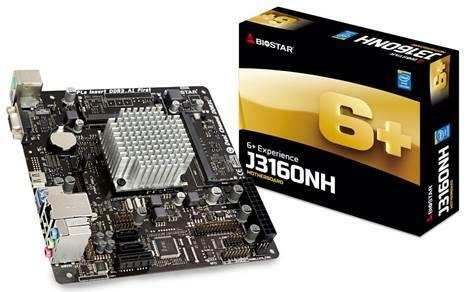 The new J3160MD motherboard features a built-in Intel Celeron J3160 quad-core processor. The Celeron J3160MD is a Braswell-based refresh SoC processor, with 1.6GHz default clocks on its cores, with Turbo up to 2.24GHz. The BIOSTAR J3160MD supports both VGA and DVI display output. DVI is a digital output connector that allows 1:1 pixel data to be transferred from your sys to the panel for a clearer and more optimal display connection. The new motherboard, Mini ITX Form Factor Dimension: 17cm x 17cm ( W x L ). USB 3.0 allows faster connectivity to modern components and peripherals along with support for up to 5Gbps bandwidth and is fully compatible with older USB2.0 devices. There’s DVI, and USB 3.0 connectivity on the back, ensuring you won’t have any issues hooking your devices and monitor up to that motherboard. Of course, you can option for a discrete GPU, and then you can have DisplayPort or HDMI connectivity if you need it. Besides improvements in processing speed, Braswell Refresh boasts a new 14nm fabrication process which gives the SoC a smaller die which needs less power (6w) and produces less heat. A heavily improved 8th-gen Intel HD Graphics processor with twelve Execution Units (EUs) is baked into the SoC compared to the 4 EUs of the older gen model and Connectivity is also improved with the native support for DDR3L-1600 speeds, SATAIII and up to 4 USB3.0 devices.